The NEW SERDI SW 1100 workstation will replace the SW800 for a larger and heavier head capacity - up to 44” / 1125 mm! Done for removing cylinder head's valve springs. The pneumatic piston decreases operator's fatigue and increases productivity. The NEW SERDI SW 1100 is the most universal work station with easy access to all faces of the cylinder head. 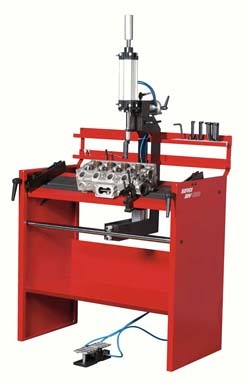 Its speed and easy use makes it a superior cylinder head workstation.